KUNSTENISRAËL helps bring leading arts professionals – museum directors, curators, presenters, journalists, etc. – to experience first hand the diversity and depth of Israel’s cultural landscape. In conjunction with international cultural organizations, and with the expert guidance of curator Ronit Eden, our custom tailored group tours bring together the culture makers of Israel with the community of arts presenters in the Netherlands. Participation in research trips is by invitation only. The Jerusalem Post and online platform ISRAEL21c featured an in-depth interview with KUNSTENISRAËL’s director Ken Gould about the curator trips. For the special occasion of our tenth trip (October 21-28, 2017) we’ve welcomed 7 participants: Julia Geerlings (independent writer and curator), Johan Gustavsson (1646 and the Alternative Art Guide), Yasmijn Jarram (independent writer and curator), Heleen Ketwich Verschuur (Museum Jan van der Togt, Amstelveen), Dingeman Kuilman (Stedelijk Museum Breda), Niekolaas Lekkerkerk (The Office for Curating / Artistic Director Poppositions) and Siebe Thissen (Public Space, Rotterdam). Our ninth trip (April 1-8, 2017) had six participants: five curators and one journalist. Here, you can read reports by Bas Hendrikx (Marres, Maastricht), Lennard Dost (Nieuwe Vide, Haarlem), Rianne van Dijck (See all this), Stijn Huijts (Bonnefantemuseum, Maastricht) and Zippora Elders (Kunstfort, Vijfhuizen). Our eighth trip, October 22-28, 2016 treated seven participants, including one journalist, to an exhaustive array of art and artists. One of the themes of the trip was religiously inspired art. Read about the trip in this report by Wouter Prins (Museum of Religious Art, Uden), the report by Sandra Smeets (art critic NRC Handelsblad) and the report by Katja Weitering (Museum Catharijneconvent, Utrecht). Our seventh trip (March 26 – April 1, 2016) was comprised of six curators and one journalist. Some of the participating curators have concrete plans to present works that they saw during this trip in their museums. There are two fascinating reports (in Dutch) of the trip, by: Meta Knol, director of Museum De Lakenhal, Leiden, and curator Daniela Petovic & journalist Edo Dijksterhuis. Six curators from leading arts institutions participated in our sixth trip (November 13-17, 2015), visiting studios of more than 40 artists – some upcoming, some world-famous, in Jerusalem, Tel Aviv, Haifa, Holon, Herzliya, and Um el Fahem. Two participants made reports: Lucette ter Borg’s report presents some highlights and Rob Knijn’s photo essay gives a vivid impression. The fifth trip (March 21-27, 2015) with six curators focused on video art and photography. Read all about in this report by Jacqueline Grandjean (director and curator De Oude Kerk Amsterdam) and the report by Bernadette van Woerkom (curator Joods Historisch Museum Amsterdam). Read about the fourth trip (December 6-11, 2014) on Annemarie de Wildt’s blog. The third trip (November 2-7, 2013) took five curators from leading Dutch museums to Israël. Read in this article (in Dutch) from the Jewish weekly NIW about their experiences. The second trip (March 3-7, 2013) focused specifically on photo and video art, and the participants – Hripsimé Visser (Stedelijk Museum Amsterdam), Femke Lutgerink (Fotodok, Utrecht), and Bas Vroege (Paradox, Edam) – kept a detailed blog (in English). 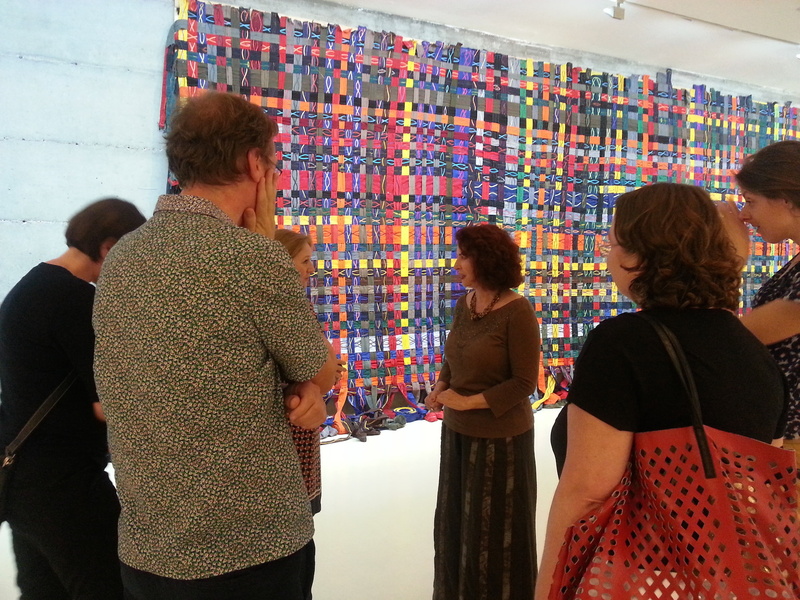 The first KUNSTENISRAËL trip (March 5-11, 2012) was geared towards visual arts in general. The impressions of the participants are documented in this article.